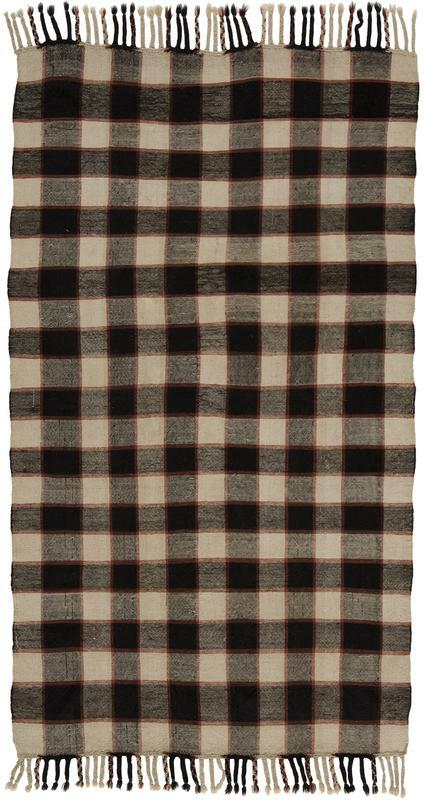 4' 1" x 7' 4"
Black, white, ivory and soft brown combine to create a lovely plaid effect on this unusual Azerbaijan kilim. It is as if the design were composed of superimposed, translucent intersecting layers of vertical and horizontal bands, producing some squares in black, others in ivory, and some with dark or light gray tonality. Thin brown stripes accent the intersecting grid effect. This piece even managed to retain its original tribal end finish of long braided fringe.